← Can the ACL Be Repaired Safely in Children? Don’t call it over-training, they say, call it over-reaching. Or better yet, call it under-performing. All that to get away from the accusatory tone that comes with the word. How much is too much? Well, it all depends on how they play, right? At the ACSM conference I attended a session on “Over-training” in high-performing athletes. I particularly tuned into “team sports” and “endurance athletes,” courtesy of Dr. William Sands (gymnasts) and Dr. Randall L. Wilber (track athletes). Fatigue is the enemy, for sure. It is more related to the volume of the workload than the intensity of the effort. So, to be efficient in training design, integrate performance conditioning into the coach’s training plan. 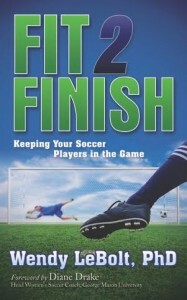 This is the principle Fit2Finish has developed: organize the game to train the desired fitness. Don’t separate them. have athletes report areas of soreness. Identify asymmetries and target this with training, giving more time to weaker areas. Roger Bannister, the 5 days before he ran the first 4 minute mile had NOTHING on his training log. He rested COMPLETELY. Amber zone – 2 parts: moderate training load (functional performance) and high training load (“functional over-reaching” = competitive training demands with controlled higher loads stimulating improvements in performance. Use under the guidance of trained sports medicine personnel and proper monitoring. FUN Fact #1: many high level athletes say that one must push beyond the amber line into the red zone in their training to recognize where this line is so they can approach it but not cross. Teach your athletes to monitor their rate of perceived exertion (RPE). How hard are they working on a 10 point scale? 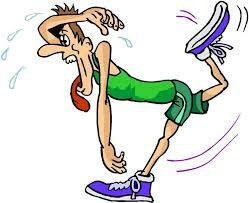 Gradually progress athletes from moderate to high intensity training. If they’ve been ill or injured, take them back to active recovery phase of training (green zone) and gradually climb back. Monitor their general health. Health screening for nutrition status, blood work. Monitor recovery work outs to be sure they are recovering and not pushing to compete with training partners. Recovery sleep and nutrition is essential for performance. It’s part of their training! Tapering should be part of your game plan for peak performance in important meets and competitive events.